protec-tion (breaker) or operated from a power supply generator using a 50 amp 230Vac. Vulcan is compact, only 29 3/4” long, 11’ wide and 14” high, it can be setup where heat is needed with-out long ducting and heat loses. When ducting is required, 10” dia. flex can be connected to outlet and inlet sides. The heater is easy to store and light enough for one person to setup. 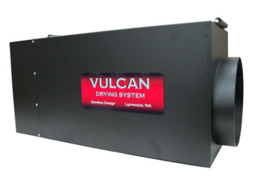 - Vulcan delivers 19,000 or 37,000 BTU on 30 or 50 amp service with precise temperature and air flow control. - Programmable Temperature controller with digital dis-play can regulate heater temperature up to 160º F. Included is 25’ long ..thermocouple to monitor remote containment air or material temperature.
. 15º F.per.heating element with air flow set at 300 cfm. - Variable air flow from 100 to 400 cfm will deliver heat where is needed. - Vulcan heater outlet and inlet have 10” dia. flex duct connections. - Heater is safe to operate in horizontal or vertical position. - Vulcan can be handled by a single person as it is com-pact and light. Net Weight With Filter…………..57 lbs. with UL 1278 & CSA/IEC 60635 electrical safety standards. Compare with any other heater out there.